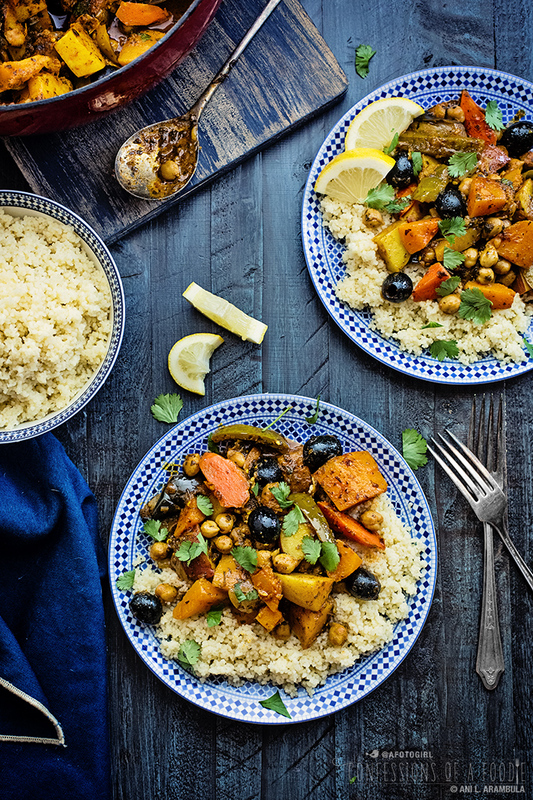 This vegetable tagine is both vegan and easy, bursting with flavor with help from Mina Tagine Moroccan Cooking Sauce. 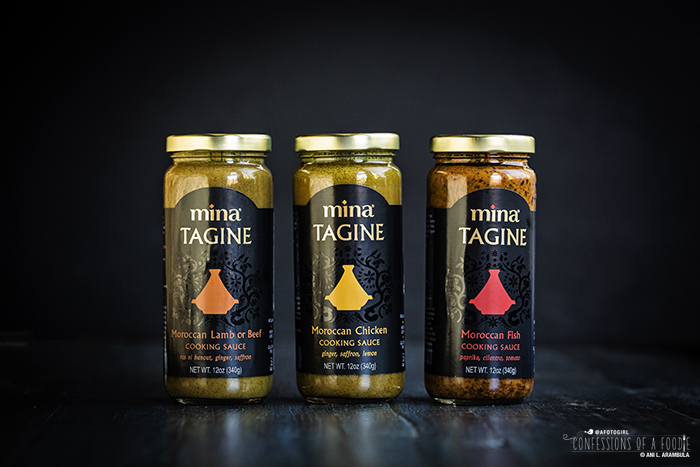 Bringing the taste of Morocco home is made easier with the help of Mina Tagine Moroccan Cooking Sauces. 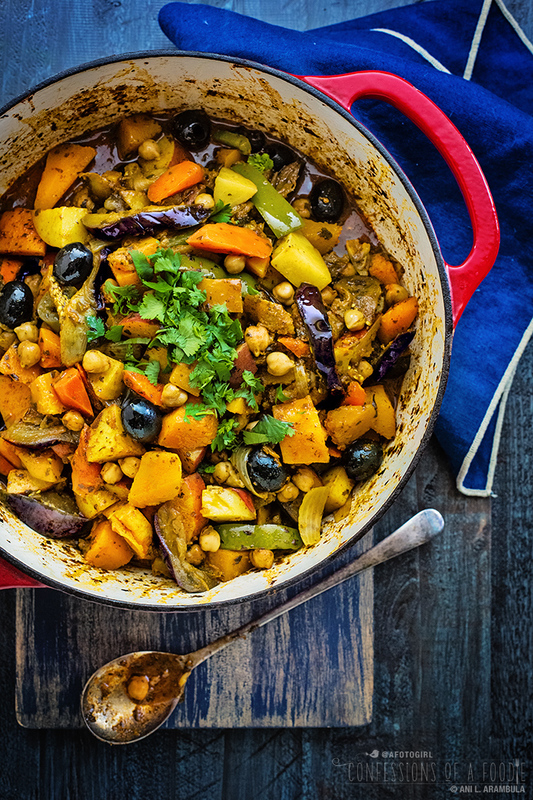 Today I'm sharing the one formulated for fish which I've used to make this satisfying vegetable tagine. 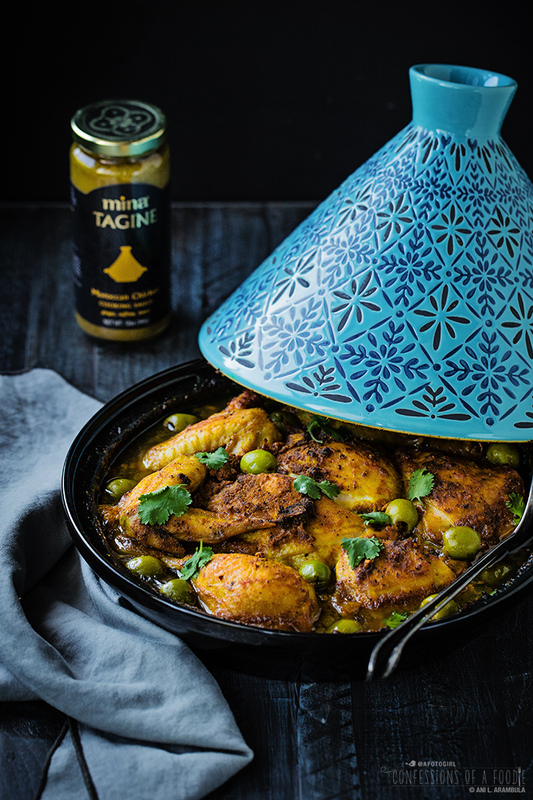 I'm back with another tagine sauce today from Mina. 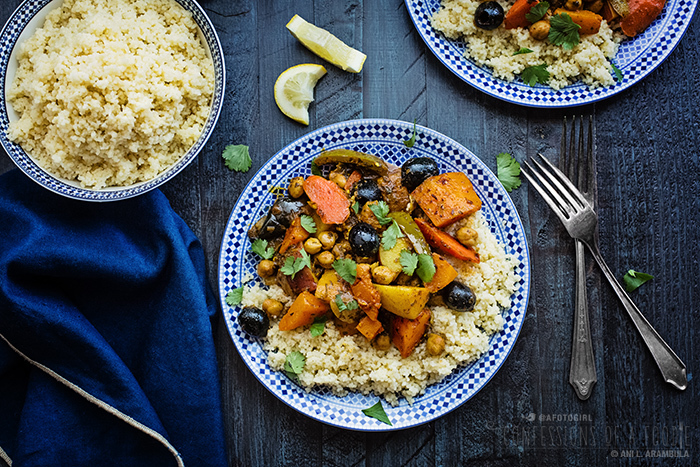 If you've been following along on this tagine journey of mine, you know that tagine is Moroccan and it refers to both the cooking vessel and the name of the dish cooked in it. You also know that Mina sent three sauces for me to try, each for a specific protein: chicken, beef/lamb, and fish. I've already posted on the chicken and the beef sauces. The last one I had left to try was a fish cooking sauce. After a lifelong aversion to fish and being new to eating it, I am not quite ready to tackle cooking it myself yet. Well, at least not on my own. So I proposed that I use the fish cooking sauce to make a vegan tagine. The folks at Mina loved the idea. I included the traditional vegetables normally served in a fish tagine: potatoes, green bell pepper, and carrots. Also traditional, are dark olives and I choose to use pitted California black olives. I substituted the fish with butternut squash and eggplant which are two of my favorite vegetables with a "meaty" bulk to them. I also added onions and for protein, a tin of chickpeas. The fish cooking sauce is tomato-based and I loved how it complimented all the vegetables I used. Now after having cooked and enjoyed all three sauces, I have to admit that I absolutely loved this vegan version with its luscious reddish sauce. As much of a carnivore as I am, I really enjoy vegetable-based dishes. What? You ask? Didn't you just post two recipes in a row using tongue? I know. I know. I'm a bit contrary. My aunt said as much to me today when I was telling her how much I loved this tagine (she is partial to the chicken one I made). The chicken tagine had a nice tingle on the tongue from the peppers and various warm spices. 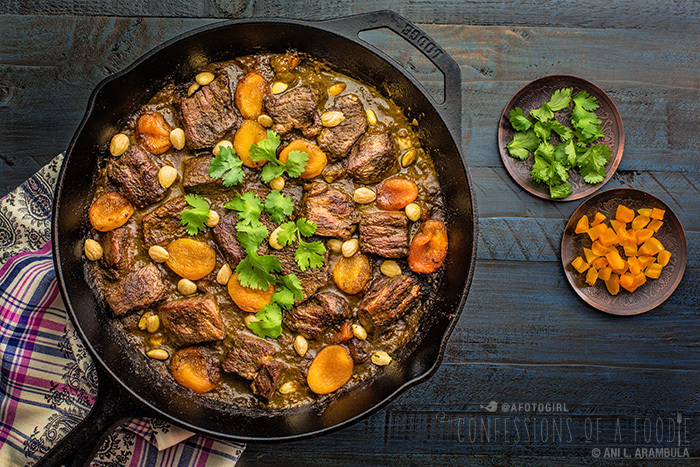 The beef was slightly sweet with the addition of dried apricots added towards the end of cooking. 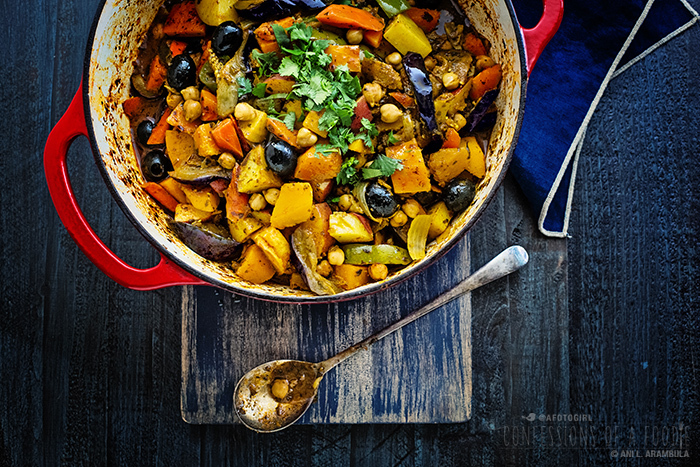 This vegetable tagine has that slight tingle from the warm spices which is well balanced by the acidity of the tomatoes. The dish is hearty and satisfying without leaving you feeling heavy and sluggish. 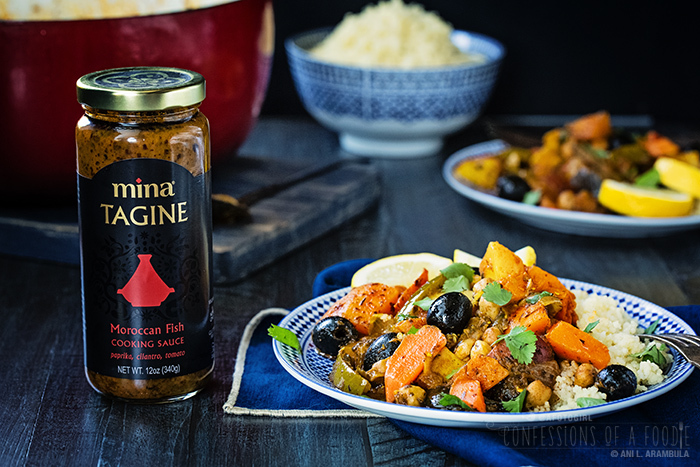 Part of my discussion when Mina reached out and asked me to try their sauces was that I would cook each sauce in a different cooking vessel to show that you don't necessarily need a tagine to cook with these sauces. The first one I cooked was the chicken. I went out and picked up a tagine specifically for it. I loved this cooking method. The tagine I bought was not the unglazed clay version but a ceramic one with a glazed interior. I found that this acted very similarly to a Dutch oven with the tight-fitting conical shaped lid forcing the steam back down, creating condensation and keeping the sauce from evaporating and the meat super tender and juicy. For the beef, I used my trusty cast iron skillet but really, any heavy-bottomed skillet would do. This is probably the method most people would attempt as a good skillet tends to be in every kitchen. I loved being able to get a nice caramelization on the meat and turn around and utilize the brown bits stuck to the pan as extra richness once the sauce was poured in. The only drawback I found with this method was that even with a tight-fitting lid, the sauce evaporated so much halfway through cooking that I had to add liquid to the pan. Which actually is just fine because this sauce was so packed with flavor that even adding additional liquid did not dilute the final outcome. The sauce was still thick and flavorful. I might also need to attribute the evaporation to the fact that this dish had to cook for double the time recommended on the jar because I bought a relatively tough cut of beef. So, you know, my bad. Lastly, for this fish version, I used my Dutch oven. This method worked very similarly to the tagine version and other than the small amount of water I swirled in the empty jar to loosen any sauce left in it, this method required no additional liquid halfway through cooking as the beef version did. Again, disclosure, though: since this was only vegetables and having cut the harder ones smaller than the softer ones, they all cook relatively even and more quickly than raw animal protein would have needed to cook had it been a part of this version. These sauces have found a permanent home in my pantry now. All three have basic recipes on the jars but even more exciting are the possibilities they can provide for creative improvisation all with a Moroccan vibe. You can easily experiment, adding your family's favorite ingredients to come up with your favorite combination. I hope you give them a whirl. Place oven rack on lower third of oven. Preheat oven to 400 degrees Fahrenheit. Place cut squash, carrots and potatoes in a large bowl. Drizzle 1 tablespoon olive oil over the vegetables. Add a pinch or two of sea salt and a couple shakes of freshly ground pepper, or to taste. 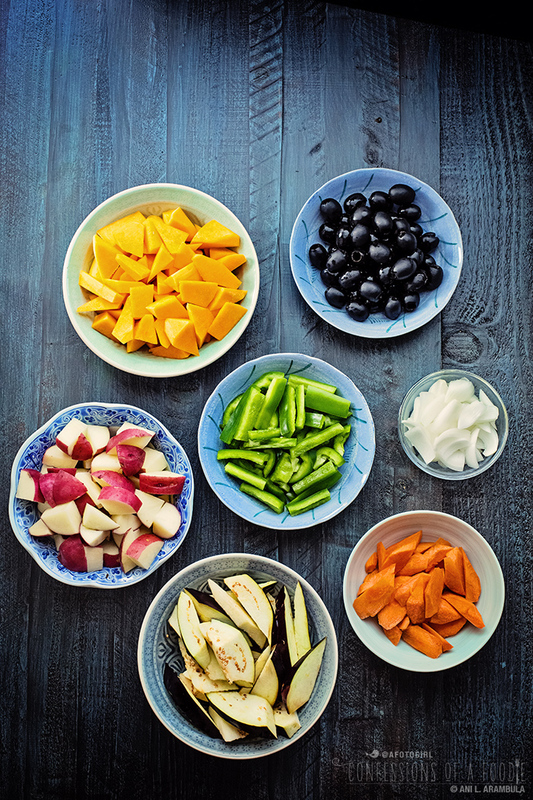 Toss vegetables to coat well. Heat a 5-quart Dutch oven on high heat. Add 1 tablespoon olive oil. When shimmering, carefully add the squash mixture. Let cook, undisturbed, for 3 minutes to give the vegetables time to start caramelizing. Stir, and repeat until vegetables are slightly browned. Place the peppers, onions and eggplant into a large bowl. Drizzle with 1 tablespoon of olive oil and toss to coat. Add these vegetables, the beans, and sauce to the butternut squash mixture; stir well. Fill the empty sauce jar with ⅓ cup water, shake well, then add to Dutch oven. Cover with lid and place in oven. Cook for 15 minutes. Carefully stir in olives and cook for 5 more minutes or until vegetables are fork tender. Serve over couscous and garnish with chopped cilantro and a squeeze of fresh lemon. This post was created in partnership with Mina. All opinions, recipes and photography are my own. Connect with Mina on Twitter, Instagram and Facebook. I occasionally work with brands that I love and use in my own kitchen. These sponsored posts help to offset the cost of running this site. Thank you for supporting my sponsors!